HTC is running a killer deal for any newcomers to VR: buy an HTC Vive or Vive Pro, and get 12 months of unlimited VR access for free. HTC has just launched its new subscription service, Viveport Infinity, which allows access to the full range of apps and games (over 600) on HTC's VR app store. 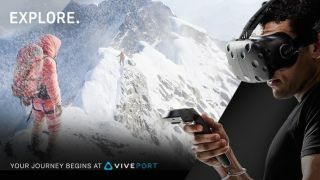 Available globally in any territory stocking the Vive and Vive Pro headset, Viveport Infinity usually costs $12.99 / £12.99 (around AU$14), but newcomers to the Vive could get a year's free subscription alongside their new VR headset. Viveport Infinity: the Netflix of VR games? To qualify for the offer, you can head to the Vive website and purchase the HTC Vive VR System (£499 / $499 / AU$615) with controllers and base stations included, the standalone Vive Pro headset (£799 / $799 / AU$1,045), or one of the Vive Pro's package kits: the Vive Pro Starter Kit, Vive Pro Full Kit, and McLaren Limited Edition, which range from £1,199 / $1,199 / AU$1,899 to £1,499 / $1,499 / AU$2,199. In Australia, the offer only applies to the standalone Vive Pro and McLaren edition. The offer is only running until April 8, while anyone who purchases in time will then have until April 24 to redeem the offer code for a free year's subscription. For anyone already with a Vive headset – the monthly subscription seems like a good deal regardless.